Pub. in The Grand American Avenue 1850-1920. Delaware Avenue became a major artery in the new park and parkway system that Frederick Law Olmsted and Calvert Vaux designed for the city in 1870. Taking his inspiration from Baron Haussmann's Paris, Olmsted, who thought Buffalo possessed the nation's best urban plan, created a network of existing streets and new parkways that connected all parts of the city with the three parks he designed for the northern section of town. The major pleasure ground was The Park (present-day Delaware Park), a 230-acre masterpiece of pastoral landscape. In Olmsted's system, Delaware Avenue was the main link between the downtown area and Delaware Park, some three miles away. 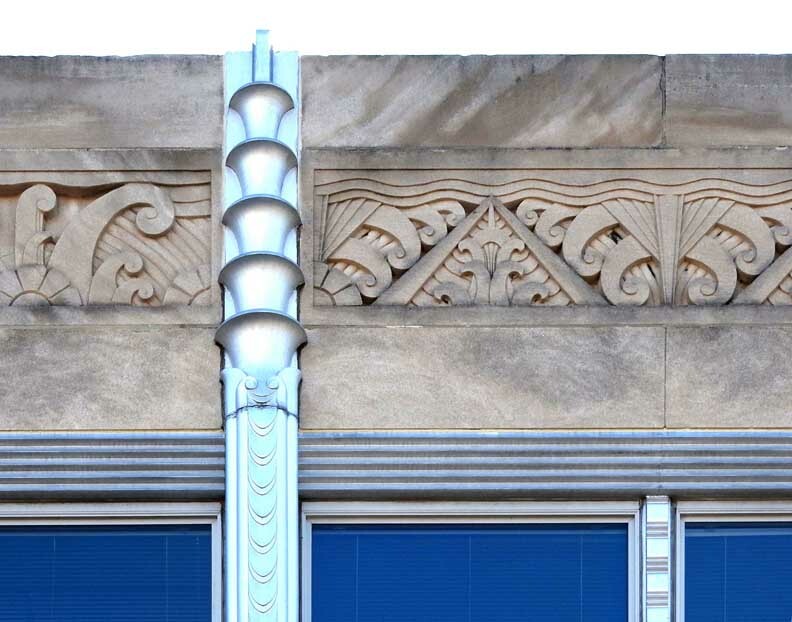 From the beginning of the age of commercialization on the avenue, merchants sought to retain the tone of quality that people had long associated with a Delaware Avenue address. To obtain advice on how best to manage the transition, the merchants who constituted the Delaware Avenue Association (organized in 1923) invited the president of the Fifth Avenue Association to Buffalo to explain how the process had been carried out in New York City. Eventually certain rules and regulations agreed to by Fifth Avenue businessmen were adopted by their Delaware Avenue counterparts. "Delaware Avenue always has been a source of pride to Buffalonians," stated Goode, "and the object of the Delaware Avenue Association is to make its business portion as attractive a commercial thoroughfare as it formerly was a residence street." The Association succeeded in 1924 in having the city widen the avenue from Niagara Square almost up to North Street. The widening of the roadway from forty feet to sixty feet was accompanied by the laying of new sewer lines, the placement of traffic signals, and the installation at one-hundred-foot intervals of 1500-candle-power electric light standards. The modernization of the avenue, however, occasioned the destruction of most of the splendid elm trees that had lined the thoroughfare, two rows on each side, since even before Olmsted's day. The effort by many citizens both on and off the avenue - including artist Charles Burchfield, who had come to town in 1923 to work in the Birge wallpaper factory - to stay the massacre of the trees was to no avail. "A platoon of the city's oldest residents went under the executioner's ax yesterday," wrote the Buffalo Courier. "They were in the way." The widening of the avenue was followed by the demolition of many houses and their replacement by businesses. A number of these were designed in Classical style in keeping with the desire to maintain the image of a "high-grade" street. 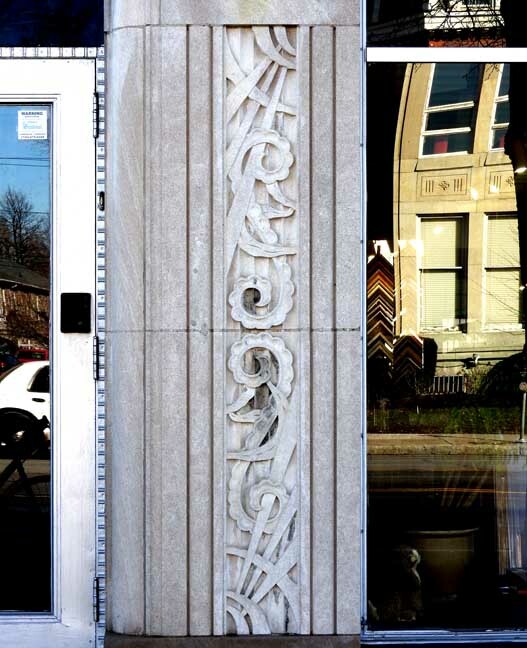 The architectural partners Lawrence Bley and Duane Lyman took a special interest in the affairs of the avenue. 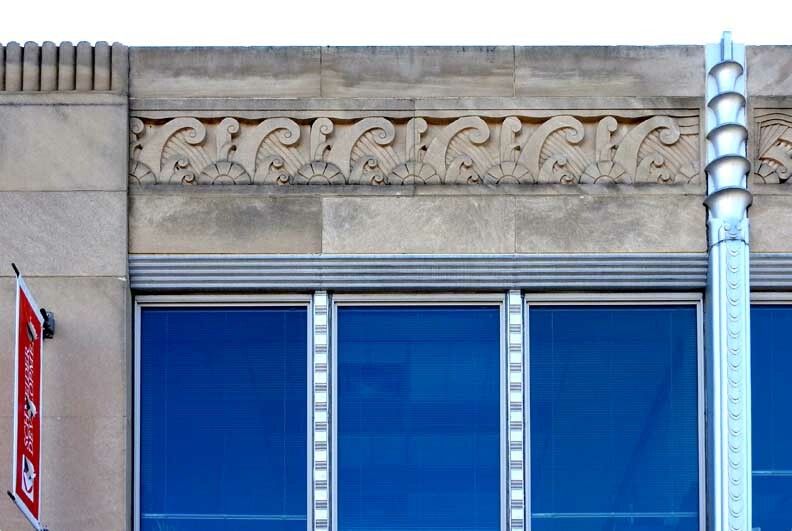 Their own building near the corner of Allen Street had a ground-level arcade of shop fronts above which broad expanses of plate glass lighted their offices). 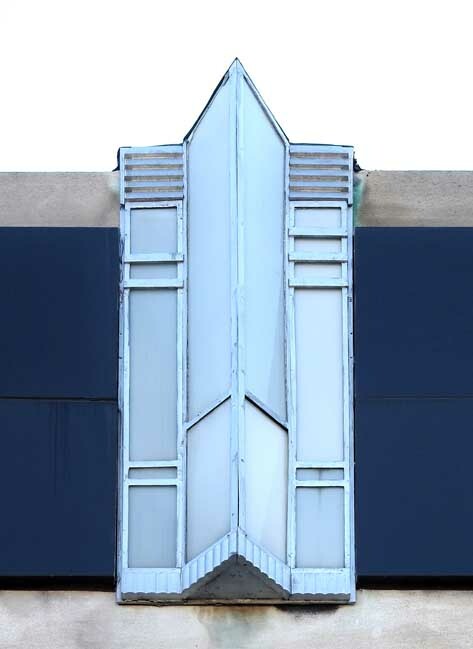 Bley and Lyman also designed the elegant Art Deco Vars Building at 344-352 Delaware and may have planned the handsome palazzo of shops and offices on the northwest corner of Delaware and Tupper. The Danahy shop was at the center of a prominent group of clothiers and seamstresses catering to a stylish clientele known as the carriage trade. Through the years, the street became an address synonymous with fashion. A new era began for Danahy's in 1961, with a change in owners. Times were changing, and as the suburbs grew in ever-widening rings around Buffalo, lifestyles were changing too. Businesses must adapt to prosper, so after 72 years on Delaware, the decision was made in 1996 to relocate to Northtown Plaza on Sheridan Drive in Amherst. An admirer of the Renaissance, an era of great creativity, Charles Jacob Schneider is himself a renaissance man: artist, published novelist, musician, singer, song writer-recorder of two CD's, photographer, and architect. But the gracious man who extended his hand introduced himself simply as "Jake." Jake is the owner of Schneider Design Architects, P.C., one of four independent architectural firms that, together with an independent photo studio, an independent digital design studio, and staff, make up the Buffalo Design Collaborative. 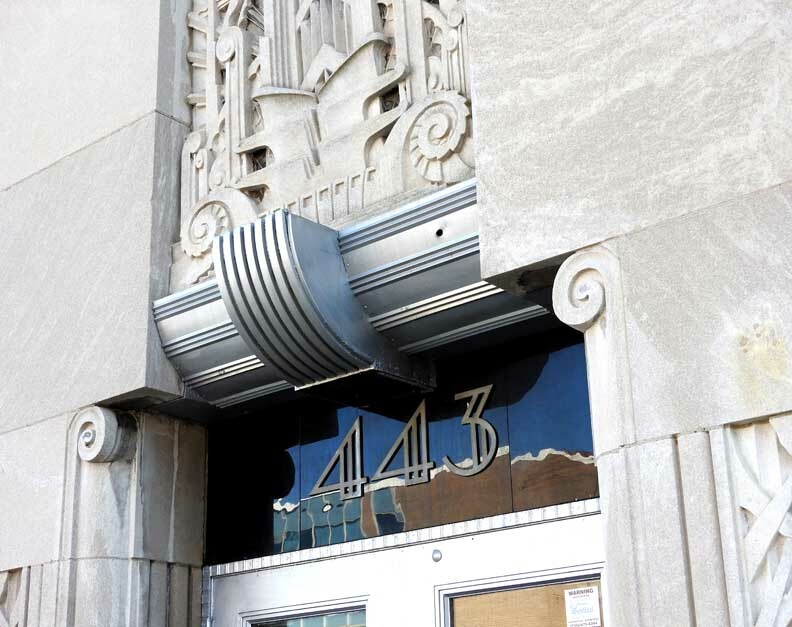 The Collaborative occupies 6500 square feet on the second floor of the circa 1930 Art Deco building at 427-443 Delaware Avenue in Buffalo, one of six projects recently honored for distinguished restoration by the Buffalo Preservation Board. Jake Schneider is also president of 427 Delaware Holdings, LLC., which purchased the building in April of 2003 and completed the exterior restoration and interior restructuring at a cost of $950,000, funded in part through loans from the Buffalo Economic Development Corporation and M&T Bank. Jake took on this sizable project because he wanted a dynamic place in which to locate his business. He looks forward to developing other architecturally interesting buildings in some disrepair in the Delaware neighborhood. "It's important to the community," he said, "and at the same time a good investment." This is an approach others can take as well, he said, as there are numerous properties in Buffalo, with its great architectural heritage, worthy of rehabilitation and restoration. "Sometimes it can even be less costly than building new," he said. 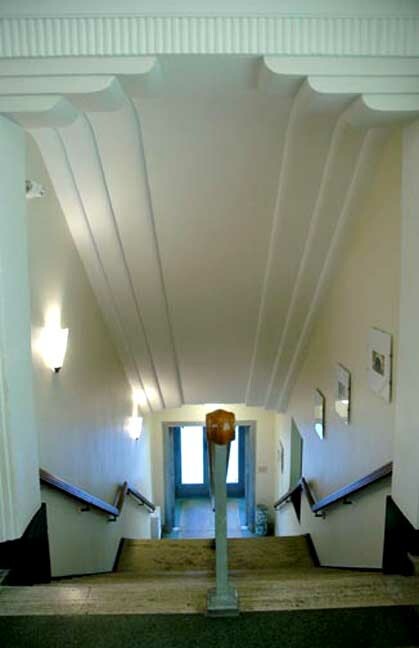 The terrazzo-floored entry and former second floor corridor, the staircase with its fluted oak banister, and the Art Deco cove ceilings were the project's only salvageable interior details, and even they had to be restored to pristine condition. The whole upper floor was gutted. Today, the second floor is a serene space for creative people, resplendent with the brilliant terrazzo floor, oak doors, fluted oak moldings, and restored cove ceilings. A central colonnade resting on sturdy oak bases demarcates individual computerized staff work stations to the right and left. 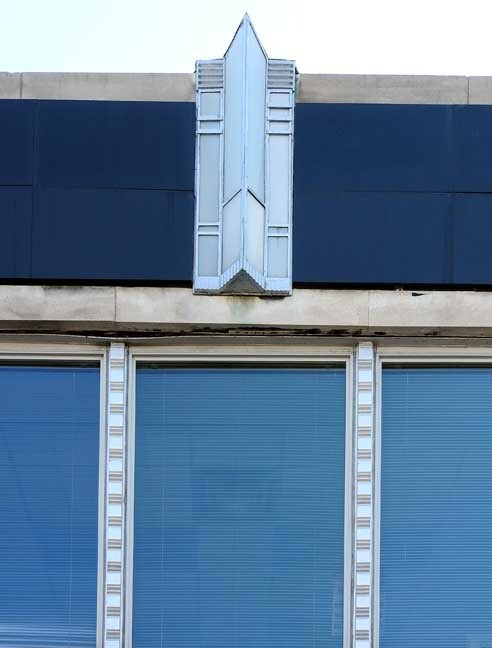 The photo studio owned by Jake's wife, Katie Schneider, is housed in private quarters to the left of an Art Deco-furnished reception area, while the architects' private offices line the right and overlook Delaware Avenue through large expanses of glass. A conference room at the end of the colonnade completes the rectangle. Street-level storefronts provide homes to several stable businesses and happy tenants, Jake said. 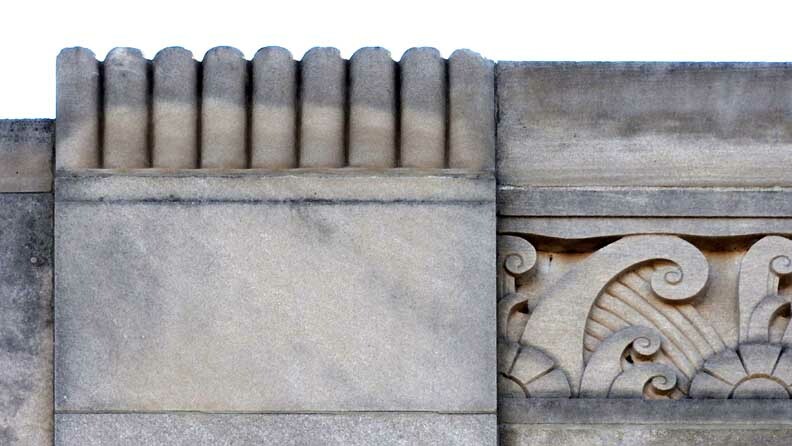 The building's Art Deco exterior and a black iron fence surrounding a newly black-topped parking lot at the northeast corner of Edward and Delaware received special mention in the Preservation Board's award. 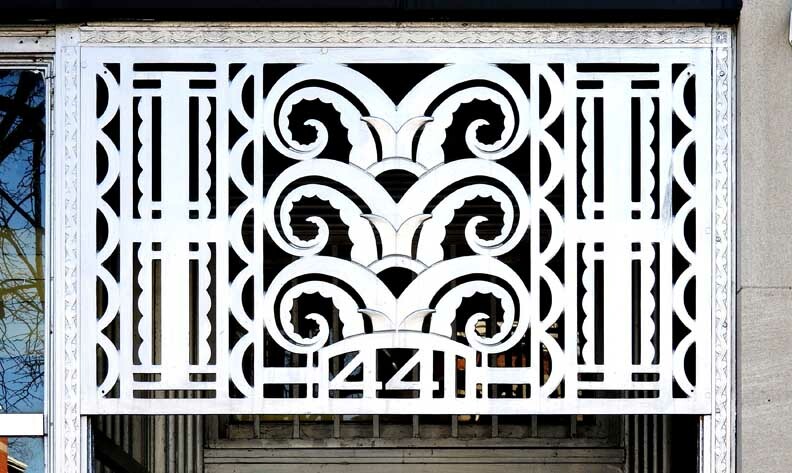 The fence, designed by the Collaborative, bears its geometric logo of circle, square, and triangle, arranged vertically, and evincing the Art Deco aesthetic. Jake mentioned with special pride the work done to the former unsightly cement-block south facade of the building. 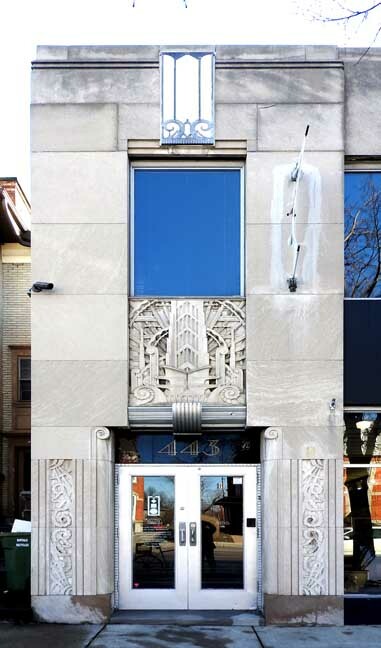 It has now been elegantly resurfaced with a faux stucco finish in shades of stone and slate gray and features a sophisticated Art Deco design wholly in keeping with the Delaware facade. Interning in Katie Schneider's studio this summer before setting out to find her niche in Chicago was daughter Sarah - like her mother, a photographer, and like her father, a University of Notre Dame graduate. Zach, Katie and Jake's son, operates the digital studio, designing websites, brochures, and other graphics media for the Collaborative and other clients. Another son, Max, and daughter, Eliza, are still in school. With such a strong family-work ethic, it's not surprising that when Jake finished his studies at Notre Dame and in Rome, he set up practice with his father, Harry Schneider, also an architect. Their firm, Schneider Design, begun in 1979, and the Collaborative, organized in 1989, occupied a vintage home owned by father and son at 520 Franklin, where, given already-defined spaces, they had to adapt to working between the building's two floors. It's different in the new space. "Here, we were able to design the space to our needs," Jake explained." Our staff takes more pride in their work, and we've managed to create a sense of place." 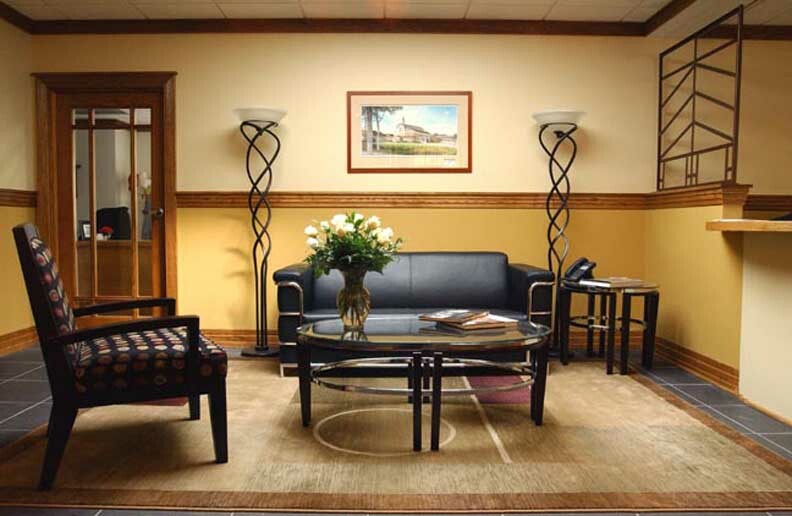 He added, "I love having my clients come here. It's just a very nice environment to work in." The spirit of Duane Lyman lives. 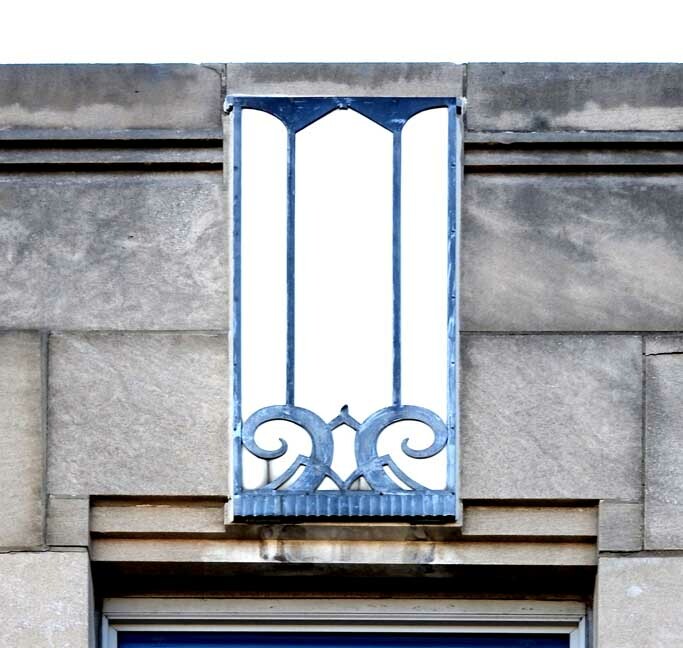 When Jake Schneider bought a Lyman-designed building on Delaware Avenue, he did more than bring a long-neglected, architecturally significant structure back to life, he did so in a loving, almost meticulous manner that befits its legacy. 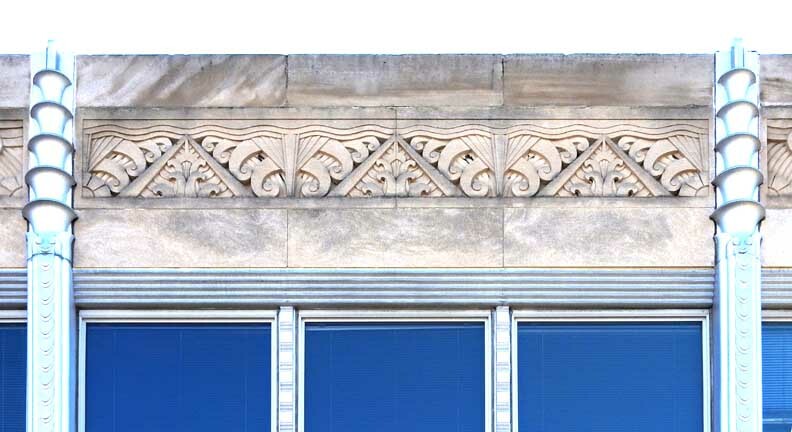 Lyman, one of Buffalo's most famed architects, designed the two-story, 15,000-square-foot building, located at 443 Delaware Ave., in a classic art deco vein. The building dates back to the late 1920s. Among the buildings that are part of Lyman's portfolio are the Saturn Club, the downtown Buffalo federal courthouse and the Miller Mansion on Nottingham Terrace. 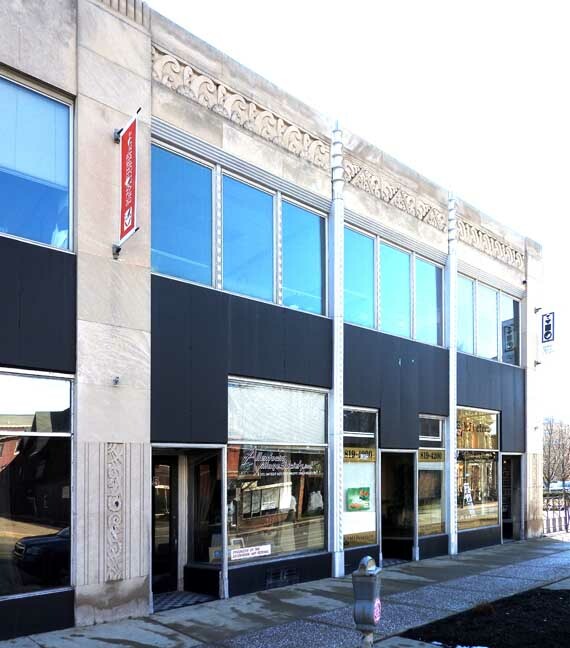 The roots of Schneider's project go back a few years, when he realized his Buffalo Design Collaborative, a consortium of seven architects and adjunct services relating to architecture, had outgrown its home on Franklin Street in Buffalo. 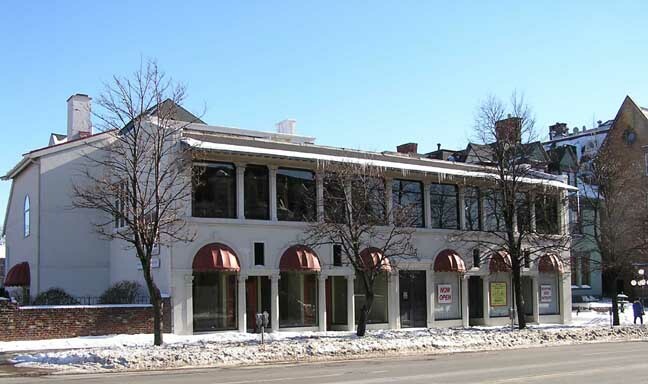 In early 2003 they came upon the former Mabel Danahy building on Delaware Avenue. 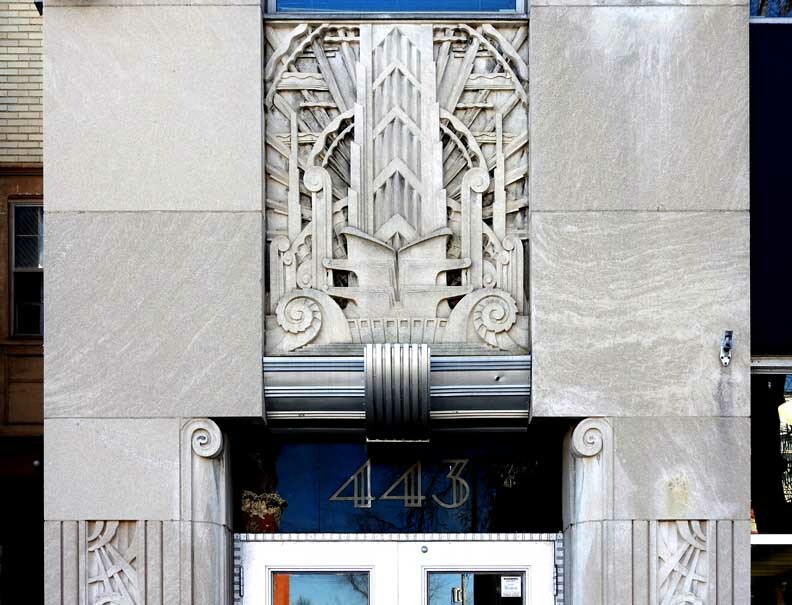 Lyman's art deco facade caught Schneider's fancy, but when he went upstairs to the second floor, everything clicked. 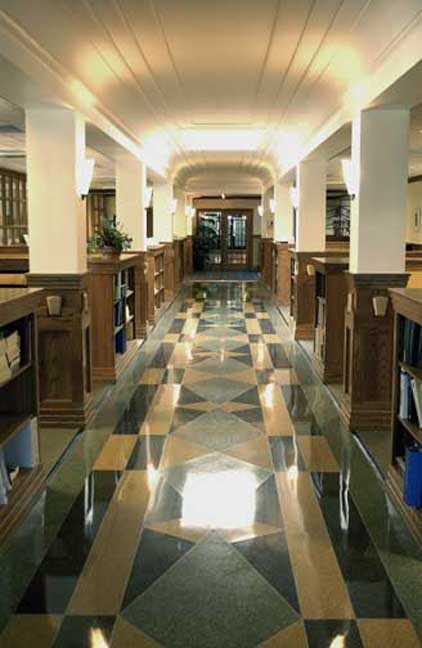 The ultimate selling point was, of all things, a multi-colored marble terrazzo floor. The floor was part of Lyman's original design. Schneider and his business partner, Greg Koessler, closed on the property in April 2003 and immediately began renovating the structure. In all, they spent about $1 million buying and renovating the place. It helped that the building was in an Empire Zone and they received tax credits and assistance because of that factor. 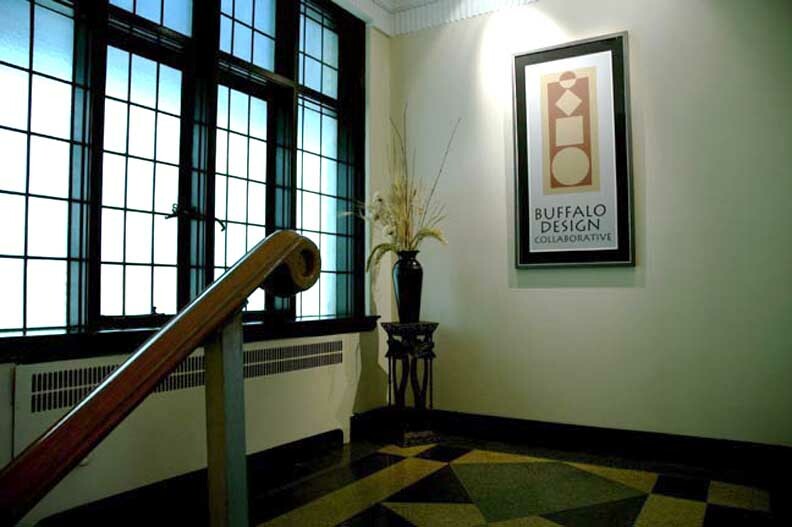 The Buffalo Economic Renaissance Corp. provided a $300,000 loan that was matched by a loan package from M&T Bank. 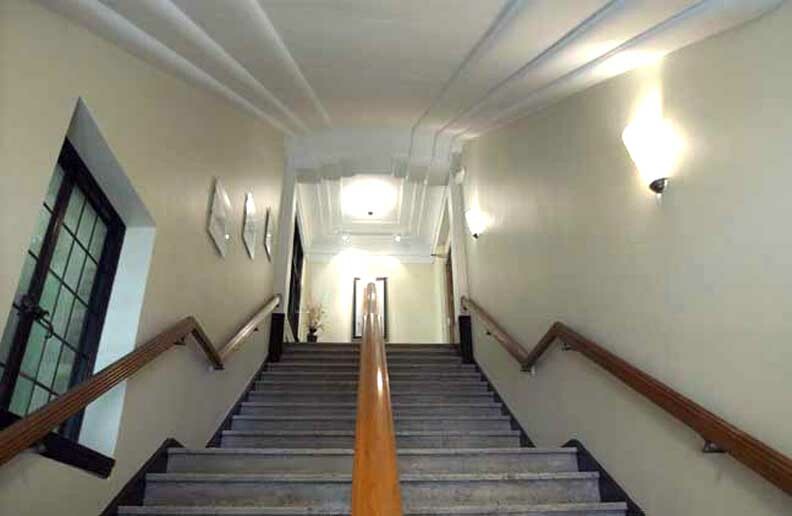 The first thing Schneider did was gut the second floor and bring it back to its late 1920s feel. Fake walls that created a series of smaller offices were knocked down. The second floor is now wide-open, well-lit and conducive to the creative atmosphere needed by architects, designers and the like. And, as a final touch, Schneider personally designed the black wrought iron fencing around the parking lot.